Like almost everything else in Las Vegas, the city has taken a favored pastime and turned it into a type of gold. Nowadays, shopping is not just about finding a blouse or a pair of shoes. It is about passing into a sort of browsers' twilight zone. Shops in Las Vegas are seeing 50,000 people a day stroll by to catch the mall-made action -- opera arias performed in St. Mark's Square, flirtations with buff Roman sentries on the Appian Way -- and counting annual sales in the arena of $1,000 per square foot (the national average is $392) along fantastical promenades that may be as large as 2 million square feet. Shopping has taken its place high in surveys of the reasons people visit here -- just under "pleasure." "We are finding that visitors, on average, spend more on shopping than on shows and sightseeing combined," says Erika Pope, of the Las Vegas Convention and Visitors Authority. Enter Town Square, the newest shopping land in Las Vegas and the ninth to grace Las Vegas Boulevard between Spring Mountain and Warm Springs roads. Because it's Vegas, it has to have that element of "shoputainment," and for all its chain-store popularity, Town Square doesn't disappoint. When the new 1.5 million-square-foot "lifestyle center" opens Wednesday near McCarran International Airport, it will sweep the imagination of browsers with a Main Street appeal -- that is, Main Street Barcelona, Main Street Milan, Main Street Casablanca and Main Street San Diego. It's a mélange of architectural motifs, taking a "Grove" approach to shopping in a city where land is still widely available. Rather than pedestrian promenades, you have streets -- with parking meters -- and second-story loft-like elevations with offices (the Las Vegas Chamber of Commerce is a new tenant). It's a veritable town of 150-plus shops, more than a dozen restaurants, several entertainment venues and a variety of facades to keep it all interesting. "We're mixing it up: a little contemporary, a little modern, some classical, a lot of Old World," says the project's general manager, Mike Wethington. "It's designed as a lifestyle center, a place to come whether you are alone, with friends, with family, and you can find a degree of comfort and familiarity mixed with some really interesting designs. What you won't find here are traditional department stores." Coming to Town are Tommy Bahama, Old Navy, Abercrombie & Fitch, Fossil, Godiva, Steve Madden, Swarovski, Chico's, Skechers, Soma, Solstice and Victoria's Secret. 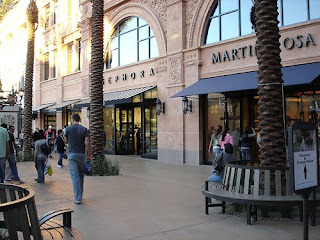 The lengthy list (at www.townsquarelasvegas.com) also includes Borders and Whole Foods Market, an Apple Store and a 90,000-square-foot showroom for Robb & Stucky. Diners will find Tommy Bahama's Tropical Cafe intriguing. You can shop for shirts and then sip a mai tai on the patio overlooking the park. Yes, there is a park, just a like in a real town. And this 9,000-square-foot patch is the project's centerpiece, with a hedge maze, a 25-foot-high tree house, pop-up fountains, a Tom Sawyer house, a mini replica of the center, storytelling stages and plenty of benches for visitors. "We are dedicated to the concept that this is a lifestyle center, not just a mall," says Wethington. But that lifestyle also includes plenty of celluloid entertainment, with a 91,000-square foot, 4,000-seat, 18-screen movie theater. Scene-style bars and restaurants and casual cafes flank the corridor to the Cineplex: Yard House, for 250 types of beer on tap; the Grape, with 150 wine varieties available by bottle, glass or flight; and a Brazilian steakhouse called Texas de Brazil. For all its entertainment and amusement value, the marketers of Town Square see potential in its location as the last chance to shop for visitors heading to the airport. The center sits practically adjacent to the centralized off-site car-rental facility that opened this summer just west of the airport, and bag check-in options combined with shuttle services are being explored. Shopping packages with Strip hotels are in the offing as well. For now, a concierge office at the new shopping center will arrange transportation for guests, assist with reservations and offer other services. Meanwhile, Town Square's location at the southern end of the city, just past the Strip on Las Vegas Boulevard, places it conveniently next to Fry's Electronics and across the way from Las Vegas outlet center, where name-brand and designer items get the red tag. You'll find your Jones New York and Tommy Hilfiger seconds here, tailored jackets for less than $100, the red, white and black Tommy Hilfiger-labeled shirts for less than $14 on clearance. Even Bose has an outlet here, although prices rarely run below a 10% discount. But Town Square will be fully retail, with no bargain boutiques in the plans. It's opening in time for the holiday shopping rush, and designers are planning to hoist a 40-foot Christmas tree, build a Santa house and create a "Norman Rockwell Holiday" with six interactive dioramas or "vignettes" that depict what the artist might have been pondering for the season. No doubt , Town Square might've put shopping on his mind. Imagine Mom, Pop, Junior and Sis jumping out of their Plymouth, arms weighted with candy-cane-striped packages fresh from a successful shopping outing on Main Street. Some faux snow and you have yet another fantasy land on the Las Vegas Strip. For the Best Deals in Travel, always book through 'Mingle in Vegas'!